I wanted to create a gallery wall at minimal cost. Since I have so many picture frames in storage, I was initially going to reuse a few for a more collected look. However, as I was laying things out, I realized I wanted the actual color to come through the images. I wanted the photos and artwork to take center stage, not the frames. So, I purchased four white Ribba frames in two different sizes to accomplish the look I wanted. I did end up adding in a coordinating blue frame that I already had, as well as a free table lamp to create more visual balance and "weight". Design Tip: An odd number grouping of images will help you achieve a balanced look when creating asymmetrical wall arrangements. 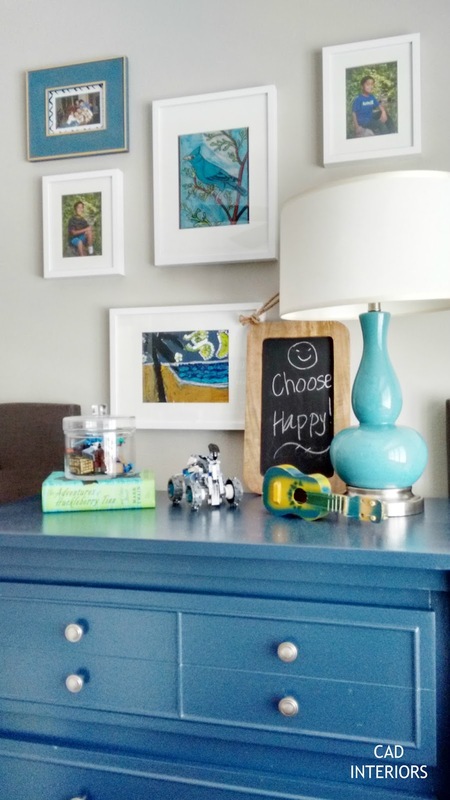 What better way to personalize the kids' focal wall than with their actual photos and artwork? So easy and cheap (or free)! With simple white frames, I will also be able to easily rotate out their pictures and add to the gallery wall over time, if I so choose. 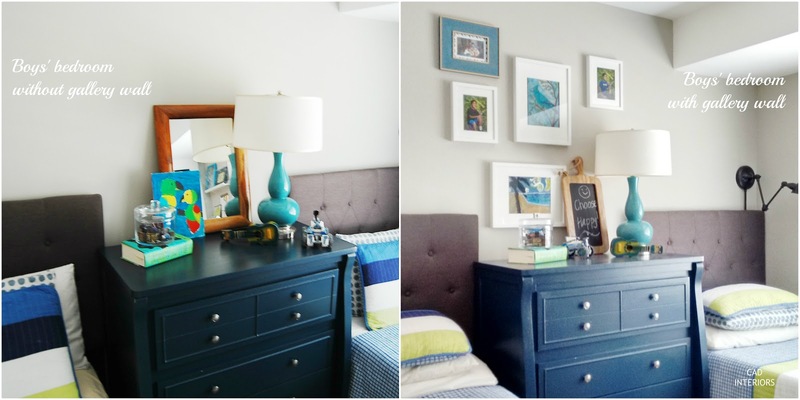 Shopping Tip: Ikea is a great source for simple and very affordable wall frames. The Ribba frames come matted and are available in various sizes. Grouped together, they create big impact at low cost! I am still looking for a new "home" for the free mirror! My boys' bedroom is now looking a bit more pulled together with the addition of the focal wall. The room is still a work in progress, but it certainly has come a long way from what we inherited. The frames are placed impeccably. Great tip for the odd number. Also, the little detail to add a blue mat in just one photo, is a statement. And makes the whole arrangement flow. You know how pictures are a 1000 words? 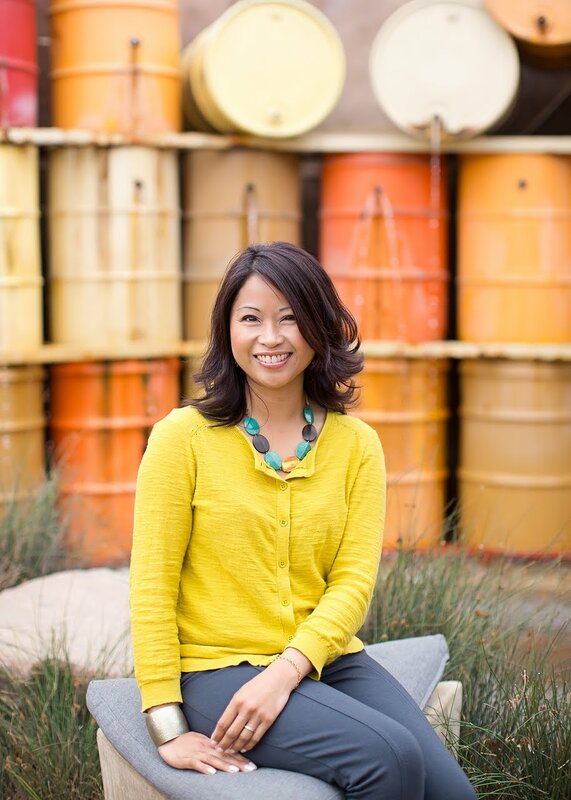 I realized this: "I wanted the photos and artwork to take center stage, not the frames." just by looking at your photos, right before I read it. Love this! I love how the white frames look with the blue. Pinning, thanks for sharing! 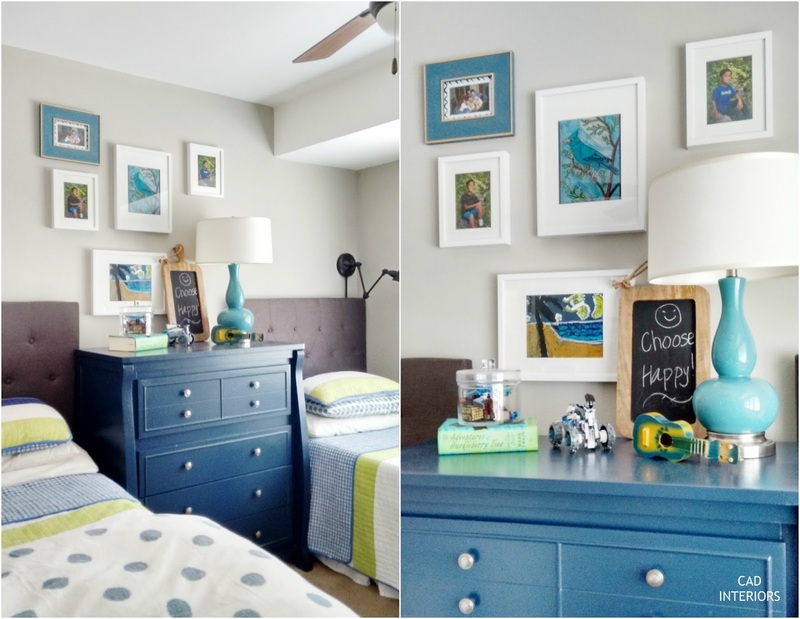 Great tips on where to find frames and to hang them in odd numbers. The focal wall looks fantastic. I love your decor style. Stopping by from Your Turn To Shine :).